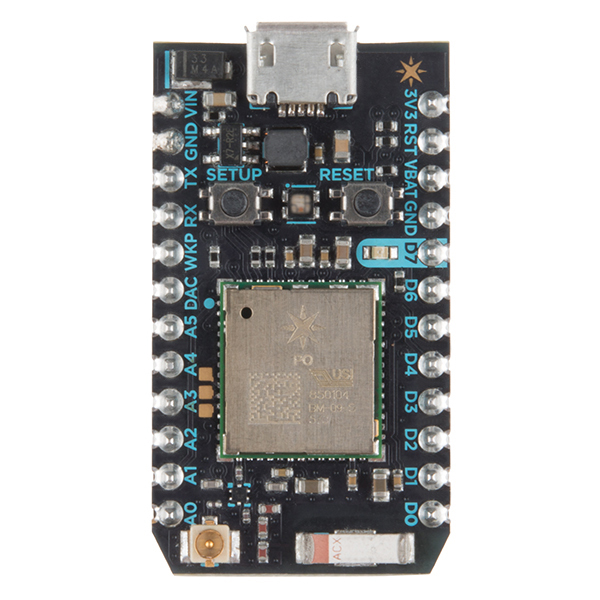 Particle's IoT (Internet of Things) hardware development board, the Photon, provides everything you need to build a connected project. 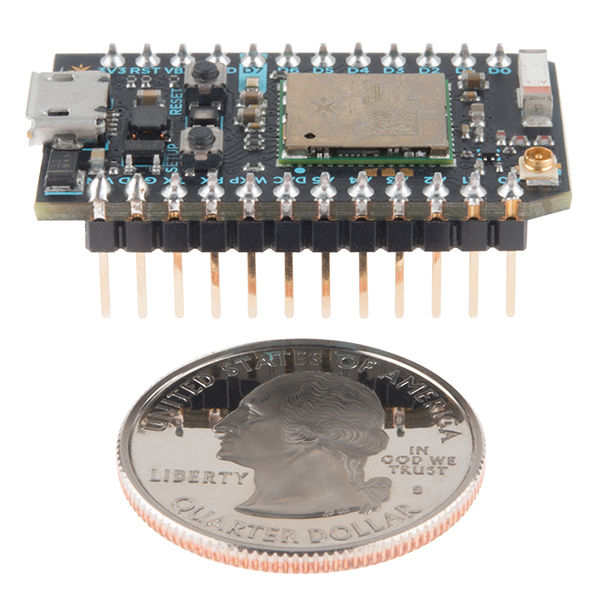 Particle has combined a powerful 120MHz ARM Cortex M3 microcontroller with a Broadcom WiFi chip in a tiny thumbnail-sized module called the PØ (P-Zero). Im new to this new types of SoC whit wifi (i work whit pic 18F some years ago) and im curios if this base can be use to create a micro web server or create and upload (email of ftp) a CSV file? My idea is to make a small Energymeter (by measuring the blinking led of my home meter) and show the values on a mini website on its own. Also probably a graph on the oled shield also. "The Photon Kit includes a Photon with headers, a shiny white mini-breadboard, a USB-micro cable, and a couple of extra surprises to help you start building right away." in the description. I think someone got overzealous in copying and pasting the one from the ACTUAL kit, product. Can my Particle things be be directly addressable on the Internet (via IPv6) or must I be blocked via IPv4 NAT hell and its various workaround hacks? I must be blind, the only pricing I can see for the dashboard is team pricing at $49/mo?? Is there any detailed information on what comes with the Photon (ie: free for hobbyists?) or a breakdown of dashboard pricing? I assume it can use other online dashboards such as freeboard.io? The photon comes with free cloud service by Particle, no subscription is needed! The dashboard pricing is for product creators who wish to manage fleets (hundreds to millions) of devices in products, etc. If you checkout their docs ( https://docs.particle.io/guide/getting-started/intro/photon/ ) I think just about everything is included in the free tier until you want to do awesome enterprise things with your products based on the Photon, and even then it's pretty reasonable. I love these things, and I keep buying more of them. The cool thing is they're WiFi ready - I just plug in power, configure on my cellphone and it's on my network. I can upload one of my many projects, plug in a cable and have a sensor running in a few minutes - usually gathering data for one of my other projects. I wrote my own web server which I load on to every new one I get, so I can see what they're all doing from anywhere, or you can use the Particle cloud to communicate and control. I use my own system rather than Particle's because that's the way I like it. The O/S is all open source and can be modified if there's something it doesn't do. I'm durned if I know what I did with my time before the mighty Photon took over my life. There's no point in me going over the features - it's all well documented, though I will say that in spite of the pin labels (A0, D0, D1, Rx, etc) you can use most pins for almost anything, with only a few restrictions. That's 17 pins in total. The photon really has some processing grunt, a decent amount of RAM and Flash, and almost 100% Arduino compatibility, so you can throw your sketch onto a Photon with a few tweaks and it'll run like a dream. One thing to watch is that digital and analog pins are 3.3v rather than 5v like most Arduinos, so driving 5v digital devices needs a bit of work. Photon digital pins are 5v tolerant so those one-wire devices and the like will just work by using a pull-up resistor to 5v. I found the O/S firmware somewhat buggy when I bought my first photon in mid-2015, but that was early days for the photon and things have improved dramatically since then. Besides, when things didn't work (like the SD Card library), I just grabbed an Arduino one and shoe-horned it in. Worked like a charm. And the most annoying thing? Apart from deciphering all the colours and flashing of the board's LED, every time I Google words like Photon and Particle I get Quantum Physics, Large Hadron Colliders and stuff like that. Cool names but rather impractical. I'll stop raving now. And no, I'm not trying to do SparkFun's marketing, I just like these little fellas. You might too. P.S. Just noticed grumbles in other reviews about being stuck with Particle's cloud stuff. Not true. You can develop locally and turn the cloudy things off. Do try this at home. I have one monitoring a farm pump far away from the internet. Also, the security risk is low if your WiFi network is properly secured. So I ordered/received my second Photon! Setup on this one was a bit sketchy but I think that it was a bad network setup on my end. In the end its up and running now. As usual I love getting little red SparkFun boxes in the mail! I really like things that "just work" without a lot of fuss - and for the most part this little device "just works". The Particle web interface is well designed and I have been able to put some complex things together in a very short time and with a minimum of fussing. I'm very impressed with the overall design of the photon all the way down to the packaging (including the inside joke). That said, there was one wrinkle: It didn't want to connect to my regular router, which is set up WEP64 and a hex password (probably the cause), but it works just fine with a spare repeating router I have temporarily set up without passwords. I have my Photon now talking to an IMU, an OLED display, and acting as a Telnet server, all on battery power and without much effort! It just works! Really easy to work with. Loving the super compact size. Really like how Particle has integrated a complete environment. Works great and easy to get started. Using that single source solution philosophy I really hope a gateway is on the Particle development table. One that is essentially an Electron/Photon combination. I have many remote IOT possibilities where broadband is either not available or doesn't make financial sense but a cellular link for $3 a month fits perfectly. Wiring multiple distributed sensors back to an Electron though is not practical. Wifi fits the bill to aggregate data back to an Electron for cellular communication back to a server - just need Wifi on the electron to bridge that communication. 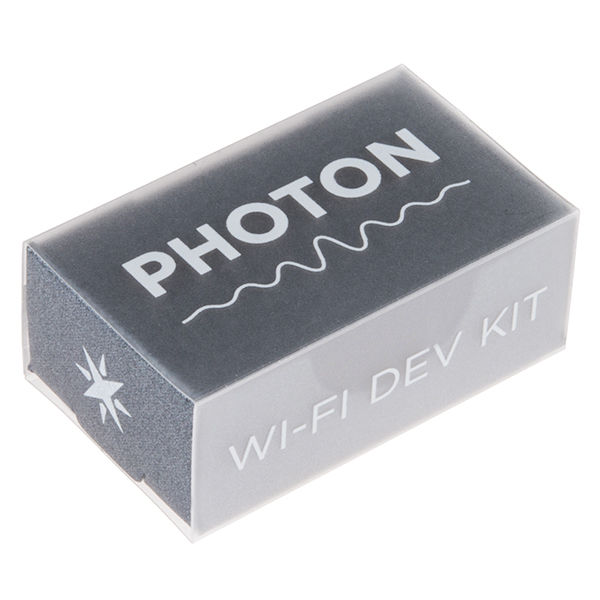 The Particle Photon is easy to connect to WiFi, and even easier to program. I have never had to connect this to a computer to program, and have even used my phone on a few occasions to change small portions of code. I have had a few issues when working with sensors like the Lm35 Temperature Sensor, but other than that small issue, I have had only great experiences with the Photon. I enjoyed controlling pins through a user friendly, web interface. At < $20.00, this is programmer is practical and forgiving. I have been playing with raspberry pis for a few years now and have been happy with the number tutorials and support available. That said, the particle photon is such a great way to get into iot. I have been targeting projects I can do with my 13 year old. The tinker interface is pretty nice for simple testing and demonstrations of features for my son, and the web ide lowers the entry barrier considerably compared to serial connections for Arduino or editing Python programs using nano on the pi. The c language used is slightly more syntactically demanding for a beginner, but that can be overlooked considering the ease of the rest of it. For example, I set up wireless temperature monitor using Dallas 1 wire protocol which published temperature data to a web page with several visuals in about 15 minutes. I am currently building a 'security system for my son's room with light, motion, and door/window sensors. The obvious drawback is the system requires internet connection, and publishing data means giving it to particle.io's web server. I'm not really nervous about them gleaning anything top secret about the light level in my son's room, so this doesn't bother me much. I solved my own problems. The product was fine but mine specifically had many problems. Don't get me wrong, typically these should work immediately right out of the box, but mine didn't and I had to go through extensive and rigorous effort just to get mine to work with a mobile device. I don't know if it was the app or the product itself but it didn't immediately connect to my mobile phone, and I'm sure it works fine for others. If you're just going to tell me to change cables and check if the blue light is blink then you can just turn around and go back from where you came. I solved my problem albeit having to look through multiple websites, and if all you can tell me is to keep checking if the blue light is on and change cables then I don't want to hear it. Android phone, app, or product, I don't know what the problem was but I got it to work and that's all that matters, I just wished it would've worked out of the box and save a lot of time. fun and functionality in the Photon ! Needed a solution to monitor tank level for my freshwater storage tank. The Photon is perfect. Using an HC-SR04 and one-wire temp sensor, it's perfect. Back into electronics now with the help of one of my sons. Just ordered a couple more Photons to start another project for temperature monitoring and relays for ventilation fans. I've used a couple dozen of these along with its big brother, the Electron. The Particle folks and the associated community are amazing. Can't recommend this platform high enough! The fact that you can update from the cloud is great for remote uses and you can tell when they are online is another plus. I've been using Arduino for years and this seems to be the next generation of open source development. I found it very easy to setup, but helps to have a good background in micro-controllers. As a web developer, I love the particle photons. They take the arduino platform I am familiar with and extend it over wifi and some cloud api layers that abstract away the tedious part. The ones I received from SparkFun were just as good as any of my others, with the added bonus of getting a bunch of sensors and another nifty red project box! I love working with these devices. I am using them all over my RV to control lighting, air conditioning and heating, blinds, and am now working on motorizing some drawers. I buy them 4 at a time to get free shipping from Sparkfun. They're currently the cheapest price I've found for them. I'd give them 5 stars if the shipping was free and as fast as Amazon Prime. Good way to get started in IoT. Use the community! I bought this for a cloud-logging homebrew monitor because I wasn't ready to figure out how to get an Arduino connected to the cloud. Particle has a great set-up because they have their own cloud and getting the Photon connected to it is very simple. I used IFTTT recipes to get it to log to a Google Sheet. The programming is just like Arduino, except the cloud functions. I would take off half a star for their documentation, which is a bit confusing for the noobs that will be using it. I'm used to all of the resources availbable for Arduino, of which there are thousands. I don't think it's bad enough to merit a full star downgrade, and the folks on the community make up for it! This is a great little device because it has built-in wi fi ! and price is reasonable. My only complaint about this board is that there are currently some supply limitation. Sometimes you have to look around for them. I'm sure this will be resolved soon. If you haven't enjoyed over air firmware updates before, buy this thing now! I really love this kind of breadboards, very friendly, very useful and a really good support. I'm a web developer and have always liked the idea of DIY home automation hardware. 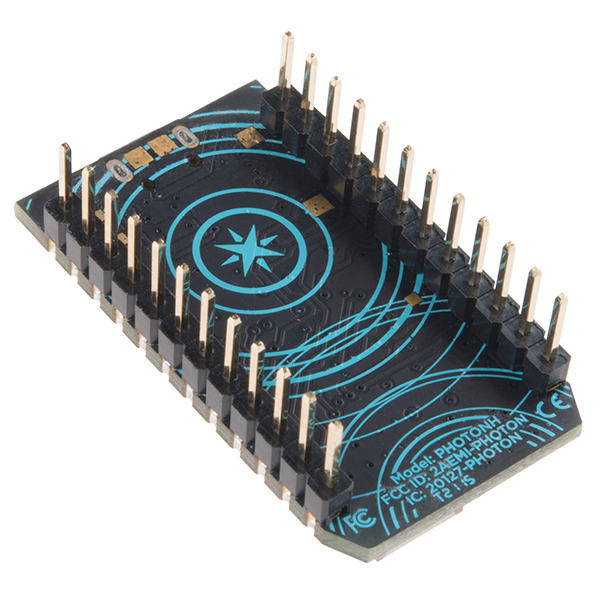 The particle photon is a dev board for software guys that want to get into hardware. Getting started is a breeze thanks to their cloud based ide, dashboard, and REST accessible variables. I had a working temperature sensor and PIR motion detector sending data to a real-time dashboard within a couple of hours of unboxing the board. I can't recommend this product highly enough! I've worked with quite a few microcontrollers over the years.... and I've had lots of ideas and started many projects with big goals.. a few of which never panned out because the technology wasn't quite there yet... Well, that's changing.. I fell in love with the STM32 processors early on... became a fairly big fan of the mBed platform on them.... but now I'm discovering all sorts of joy using the Photon.. I'm not a big fan of Arduino, or it's IDE....but aside from going on about those issues, this thing is great. This thing is powerful, fast, easy, fun and the price is great.. I'm considering going back and re-vamping previous projects to use these and make them all connected and remotely manageable! 10 out of 10, will definitely buy again and again..! While I am still new to this, I've found that the Tinker App and the Particle API are both very user friendly! I purchased a Spark Fun sewable shield and a Lilypad Simple Power to go with my Photon, which has been fun to play with. I am looking forward to learning more (I just bought Christopher Rush's book, "Programming the Photon: Getting Started with the Internet of Things" and Simon Monk's book, "Getting Started with the Photon," because I have some gaps to fill. 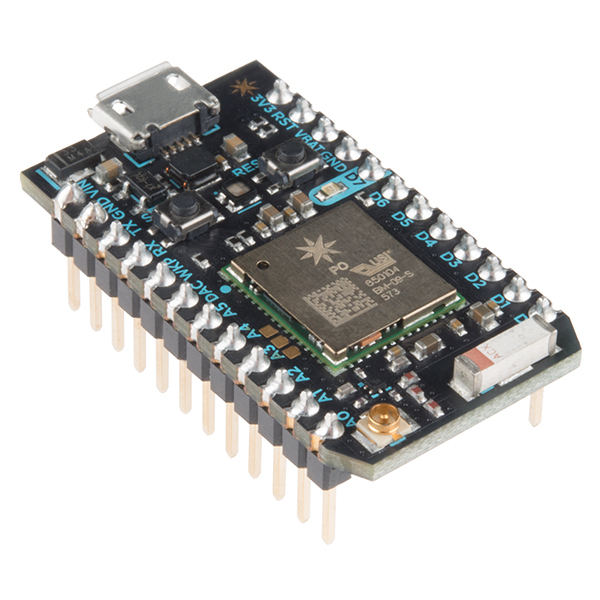 Pros: Tiny, low power consumption, versatile, built-in wi-fi, plugs directly into the SParkfun Weather Shield. Cons: Do not use the particle-cli to configure. That command is seriously broken and simply does not work. Use the Particle Android app. That works fine. The documentation is poorly written and confusing. The authors seem enamored of cutesy messages like "Congratulations! You just won the internet!" Say what? When you click on the "Click here for installation troubleshooting" button, it just takes you to the Particle home page where you then get to figure out where the installation help might actually be hiding. There's no mention that the Particle Dev program will not run in XP. You have to download it and start the installation before it tells you. Particle has bought into the "cloud" mania big time. There is no way to compile and save code locally. The Particle Build GUI is poorly designed and unintuitive. You also can't install this board unless your PC has wifi. Even though you're connected to it via USB, it insists on you logging into the wifi hotspot it boots up with. It's also a major security risk to be giving an unsecured device on your LAN the credentials to your personal wifi, like it wants. I've only gotten started with the Photon, but so far I'm loving it! It's simple to power and connect to the cloud, easy to use the Tinker functionality to experiment with zero code, and easy to push code locally or through the cloud. The only question I haven't explored yet is how it supports more exotic uses with code libraries, etc., but I'm confident it'll be a good experience. The simplicity of this platform makes it great for electronics beginners. Powerful Wifi board w/ Arduino compatibility in a nutshell. Still trying to figure out how to program 4 wire LED strip with it. However, IFTTT was pretty easy to use with the Photon. Overall, I am pretty pleased w/ this powerful little board. The photon is a great platform for any type of iot project and is also an excellent learning tool for those getting into micro-controllers. Highly recommend the photon and Sparkfun, both are great. I ordered it for testing purposes only. But i highly recommend it for any project which needs wifi connectivity. You can "talk" with it with a browser, or you can do it with app. If it is not enough, you can use Blynk and make everything possible.